This afternoon's red post collection features a heads-up that the DOOM BOTS OF DOOM featured gameplay mode is now up on live until July 27th, more Q&A with Meddler, and Riot Repertoir with context on the recent Vel'Koz PBE changes! Red Post Collection: [4.13] Live Gameplay Forecast, 4.12 Patch Rundown, Chalice plans on the Horizon, and more! Meddler returned to his Q&A thread from earlier this week to answer more questions! "Possible we might see said champion elsewhere, top lane's our prediction for where they'll probably function best based off their kit/our internal testing." "Yorick? Full rework and visual upgrade together at some point most likely. Ghoul summoning gravekeeper's got a lot of potential as a concept that Yorick's not making use of, plus the playing against experience in lane can be pretty frustrating." "We'll work on Zilean at some point and that will include replacing his passive with something more satisfying throughout the game. Will definitely investigate whether there are opportunities to use 'time mage' better as a theme as well for his kit as a whole, too early to say what changes that might result in or when though." "Don't think he's on the list at the moment. I'm no artist, so not my area of expertise, but doesn't leap out to me at least as particularly in need." "There's a full Sion rework (visual and gameplay update) underway at the moment, with a core theme of 'undead juggernaught'." "I'm a bit concerned Syndra may be too strong a lane bully at present, it's also possible we've now made her stun a bit too easy to land, in contrast to its previous state. Don't think the live balance team have any immediate plans for her, an adjustment at some point might be needed though. One of the primary intent's behind Lissandra's passive was to reduce the variance between a Lissandra with and without blue buff in order to make mid lane less of a requirement for her. That's something that hasn't been as impactful as hoped in practice, though it does have some benefits of rewarding Lissandra's for taking offensive action when their passives' are up. Would like to try out some passive modifications at some point though, potentially something in the defensive line aimed at range harass especially." "We're going through a sweep at the moment of trying to add small to moderate amounts of power to a number of champions. Olaf's one of those, with tentative changes for the next patch (others just changed or upcoming are champs like Soraka and Vel'koz). Sejuani's currently doing pretty well given the addition of Quill Coat/changes to Spirit of the Ancient Golem, recommend trying her if you haven't since those came out. Galio I agree needs some love, that's a case where we'll likely need to do some bigger work than just simple number changes though." "Constant assessment of how champions perform in different lanes and at different levels of skill/types of play, gathering of feedback (from regular players and pro players), some use of statistical analysis (as an indicator of things to investigate, not a guide) and a lot of playtesting. Same answer with any other part of the game, though there are some things that require really large sample sizes, or long periods to master, where we'll need to go with a best estimate and then continue to balance post launch." "We do want champions to have identified weaknesses, we don't want those weaknesses to be specific to a single other champion though. Many mages for example are vulnerable if you're able to dive them, which gives the other team a range of possible picks that can accomplish that. Having a single counterpick on the other hand can lead to very binary performance (did you ban out your counterpick? If so, grats, you win, if not you'll get stomped) and lack of choice for the opposition." "Reasonable at some point, though almost certainly with some constraints to ensure it's situationally powerful but not a guaranteed ability to force a 2v1 or ensure a 1v1 goes in your favor." "Plenty! The best ideas we've had but haven't finished are ones I'm still hopefuly we'll figure out a way to do. Then there's Barn the Sentient Barn, who I've got a soft spot for but, even being really, really optimistic, would have to describe as 'incredibly unlikely'." 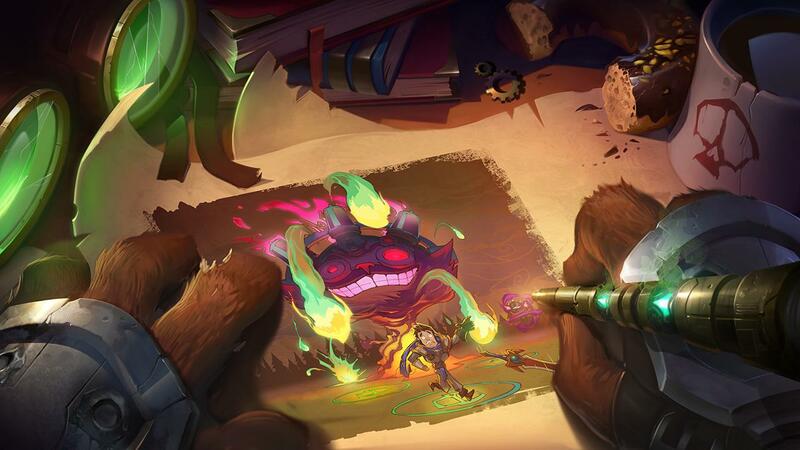 "Group brainstorming with the team working on the champion in question, plus suggestions from the wider department and anyone else that's playtesting or checking out the champ. Emotes are generally somewhere we'll be a bit looser in terms of cohesion of theme/personality since they're light hearted, humorous." "I'm generally a fan of abilities on champions that require you to build skills unique to that champ, in particular because it gives a really distinct path to mastery for players that really want to invest in that champ. Manipulating Orianna's ball, especially how you use the distance return, is another good example of that. We will be doing other champs with unique skills in that sort of line, wouldn't want to do anything exactly like Draven's axes though, that's Draven's thing." "I found player speculation on possible links between the two really interesting to read. As to whether such a theory's correct? That's not for me to say :)." "The Yordle jungler we talked about early last year was a concept that didn't work out." "Wouldn't rule it out, wouldn't count on it either though. Characters mentioned in other champions' lore can be good opportunities for future champions, sometimes characters are better suited to be non playable parts of the cast though, so a character getting named's not a guarantee they'll one day be a champion." Over on the PBE community, Riot Repertoir has posted a context thread and changelist for the recent PBE changes for Vel'Koz ! You may or may not have noticed that there are Vel'Koz changes on PBE. I just wanted to pop in and tell you guys our plan for them and a bit about our direction for Vel'Koz on the whole. Let's start with what our goals for Vel'Koz generally as a champion. When making Vel'Koz, one of the most important things that had to be true about Vel'Koz is that he fulfills the role of a terrifying laser face melter. On his release, I'd say it's fair to say he felt that way, but his ult often felt like there was something lacking if you actually built the primary mage offensive stat - Ability Power. I definitely understand that Vel'Koz is an effective support, and our changes try to give consideration to the fact that players are finding success playing him as a support. That said, our intention for the character was always that his R would be feared in a similar fashion to an ultimate like Fiddlestick's Crowstorm in that it should be an incredibly meaningful, powerful moment for Vel'Koz and an incredibly dangerous moment for opponents. Given how his R's damage scaled, it had that feeling in the early game, but with a full offensive build, it tended to lose that effect as games went on due to its lower Ability Power ratio. We knew this was likely going to be the case on Vel'Koz's release, but we decided to go forward with his release numbers because we saw him as a challenging character to pick up and play and high base damages on the R would provide a relatively standard experience per cast of the ability. Now that he's been out for a few months, we want to really emphasize that when he buys damage, he yields results via his ultimate, and that's why you'll be seeing the lower bases and higher ratios on his ultimate for now on the PBE. Again, I'd like to reiterate that we are aware that support Vel'Koz's damage will take a hit if we go through with these changes, but it is our intention that Vel'Koz's character-defining ultimate scale really well with items to better hit character highs on the ability. If taking the base damage off of a character's ultimate is the only change that moves him out of the support position, then that's probably a sign that numbers were out of whack anyway, since supports are primarily picked for their utility anyway. On the note of utility, we are indeed looking at reducing the slow on Vel'Koz's ultimate, but allowing it to stack on targets as well. For those of you that remember the Vel'Koz release teaser, we really want to bring out that feeling of him focusing in on a single target and evaporating him, and we think this change helps to clarify that purpose and achieve that goal without doing a mechanic like ramping damage or something of the sort. All other changes on Vel'Koz are aimed at just making various spell effects better match their visuals. "One thing that's worth noting is that we don't actually think Vel'Koz's current overall power level is too far off. We just think the actual distribution in power in how his ultimate deals damage is out of whack, focused far too heavily into the base damage and not enough in the scaling." "The 350/475/600 damage values I posted yesterday are the intended ones. The slow will stack up to a 75% slow, but slows have diminishing returns, so targets will not lose a full 75% of their Movement Speed." "One thing to remember about slows in League of Legends is that there are diminishing returns on high value slows. Whereas a 20% slow will usually slow for most of the expected amount, a 75% slow may only slow for around double the 20% slow after diminishing returns. If you ever want to see what I'm talking about, run through a wall of Thresh's R; despite being a 99% slow, it doesn't slow you down to ~3-5 MS."
"Honestly, we are not trying to solve "Glass cannon mages are not seeing play" with these changes, because that's probably a symptom of a greater issue that probably isn't a good idea to address with a numbers arms race or character identity misalignment. Vel'Koz was always intended to be mainly a glass cannon mage, and we'd like for his numbers to reflect that. All that said, there may be work to be done on these numbers still. Thanks for the feedback; I'm still not sold on this as a final changelist yet, so I'll keep everyone posted." Doom Bots of Doom, our latest featured gameplay mode, is now available on LIVE for the next ten days! "After weeks of tweaks and tests, the Doom Bots of Doom have been set loose onto live! If you’re looking to test your abilities against League’s craziest challenge yet, then sign up! What’s more, play a game against the Doom Bots and you’ll earn a unique summoner icon regardless of whether you win or lose (which might take a few days to appear). Get to it before we haul the Doom Bots back into the FGM workshop on July 27! And while you’re catching your breath between games, tell us about your Doom Bot stories! Did you win? Did you... not win?" So what are you waiting for? Get out there and battle the new bots or WE ARE ALL DOOMED!